After what feels like an eternity, Doctor Who returns to the airwaves tonight with a new Doctor at the TARDIS helm: Peter Capaldi. It's also the perfect jumping-on point for new viewers. Here's why: One of the biggest obstacles to watching Doctor Who is, "I want to start at the beginning." Well, hopping into the show as a new Doctor begins is as good a starting point as any. 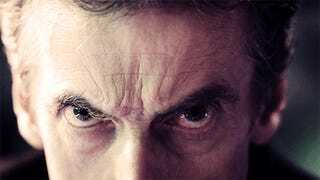 The showrunner knows this, which is why tonight's episode will have plenty of material to bring new viewers up to speed, as the 12th Doctor finds his footing. 1. The show's fifty years old. If you tried to start from the beginning, you'd have 800 episodes to slog through, and not all of 'em are pearls. 2. The show's designed to evolve. New producers come on every few years, as do new actors and writers. An episode this season might look nothing like an episode two years ago. The intent is to keep it fresh, to help it reflect the wibbly wobbly zeitgeist. 3. It's a show about Time Travel. Watching episodes in order isn't strictly necessary. Sure, you might want to watch episodes in order within particular seasons, but if you wanted to nip back after Closing Time to watch Tomb of the Cybermen, that'd be totally fine. 4. If you're not watching, you don't know what you're missing. DW fans are some of the nicest, friendliest, most fanatical people you're ever likely to meet. They can gush for hours on ends about their favorite episodes, go 15 rounds over which companions are best, and fight tooth and nail over the 6th Doctor's redeeming qualities (if they're so inclined). But unless you're watching the show yourself, you're never gonna get it. So c'mon over, get comfy, and settle in for the beginning of a new era in Doctor Who history. There's plenty of room behind the sofa to hide, if things get scary.